William Tyndale holds the distinction of being the first man to ever print the New Testament in the English language. 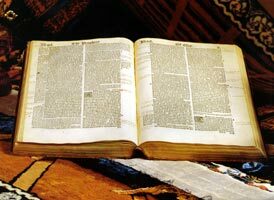 Tyndale also went on to first translate much of the Old Testament from the original Hebrew into English, but he was executed in 1536 for the "crime" of printing the scriptures in English before he could personally complete the printing of an entire Bible. His friends Myles Coverdale, and John "Thomas Matthew" Rogers, managed to evade arrest and publish entire Bibles in the English language for the first time, and within one year of Tyndale's death. These Bibles were primarily the work of William Tyndale. Read More about the History of the Tyndale New Testament & Tyndale Bibles. View Tyndale Bible materials available today.